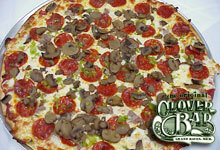 We are a restaurant that specializes in famous one of a kind Pizzas! Our menu includes Pizza, Subs, Breadstixs, Salads and on Thursdays try our delicious Spaghetti & Lasagna. We also have a full bar with a a great selection of beer and wine. Here at The Clover Bar we cater to everyone and have a large game room for the kids.